In Ulft, the FreeWheel Club is a successful example of self-organisation. For 7 years, about 70 seniors meet up every morning to participate in sports activities and share coffee. 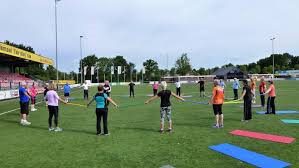 Exercising together works well here; the participants stimulate each other by being active and the social aspect is an added benefit. The fitness level of the participants has been measured over time and is improving, while the conditions of similar aged but inactive seniors is declining. Researchers from Leyden Academy have monitored the progress of members of the FreeWheel Club and published the results in scientific journal Translational Behavioral Medicine on 9 January 2018. Leyden Academy is now exploring if this success initiative in Ulft can be copied to other communities, to help keep seniors active and healthier for longer. In 2016 and 2017, we have set up three experimental peer coaching sports clubs for older adults in the city of Leiden. Our goal is to empower seniors to take charge of their daily exercise and integrate this into their routine to become healthier and happier as they age. For more information, please contact David van Bodegom.